U.S. Ambassador Linda S. Taglialatela delivers closing remarks. BARBADOS – On July 10 and 11, the United States William J. Perry Center for Hemispheric Defense Studies co-hosted a Humanitarian Assistance and Disaster Response Seminar with U.S. Southern Command and the Caribbean Disaster and Emergency Management Agency (CDEMA) at the Hilton Barbados. The event brought together participants from 18 Caribbean and South American countries, as well as British, Canadian, Dutch, and French partners. 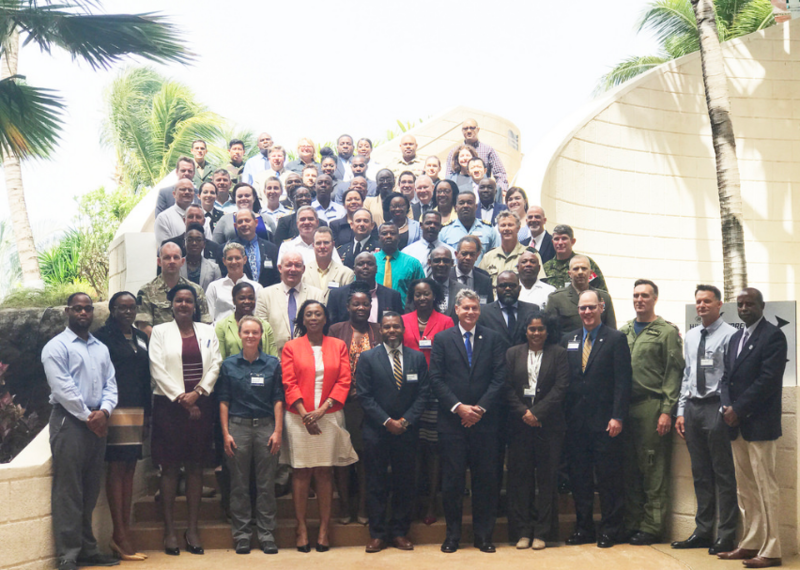 The seminar provided an opportunity to consolidate lessons learned from the 2017 hurricane season and to prepare Caribbean, partner nations, and U.S. humanitarian assistance forces for the 2018 hurricane season. 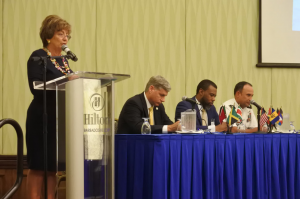 Opening remarks were provided by Gayle Francis-Vaughn, permanent secretary at Ministry of Home Affairs, and Ronald Jackson, CDEMA executive director. During the seminar panels and round-table discussions, participants gained an understanding of partner nation procedures, capacities, and gaps in humanitarian assistance and disaster response efforts. The forum also provided an opportunity to strengthen regional coordination for mitigation, management and coordinated response to natural disasters. Last year’s hurricane season highlighted the need for an international approach to disaster preparedness and response. This seminar served to further forge and strengthen relationships that will ultimately help achieve this approach that will be critical to future response efforts.